Our business is a simple one. Rent bikes through our site. Receive them within our metro area. However, it seems that we occasionally field questions that surprise us. In the fashion of sharing is caring, here are a few very intriguing quandaries. We are cycling from one state to another state, with a state or 2 in between, and wondered if you delivered, or picked up, X states away? This recent question seems to stem from the slight popularity of bike touring along a loose federation of bike trails linking regions of the USA. But this is a guess. It is a rare person who decides to ride this type of distance. Therefore no bike businesses cater to this subgroup of cyclists. They tend to have their own touring bikes. They are cycling pioneers. Their population size and distinctiveness are similar to triathletes. Our business model: Deliver within a 20 km radius to serve the most cyclists in our nation's capital. There is currently no nationwide bike rental system, unlike car rentals, since not even 2% of America rides a bike to work and 14% ride on fun short routes. Can I rent a bike for a month or a summer? This question comes from the idea that if a business rents for a day or a week, then there is no limit to what is possible. Of course, any business would be happy to accept money from the willing. But the logic of renting something that costs $40 a day, even with a 60% discount would surpass the actual value of buying a bicycle within a month's time. Secondly, there is no bike rental insurance in America. If the renter loses or damages the bike rented, then they are responsible for the full new value of that vehicle, according to most waivers and agreements nationwide. It isn't advantageous to give a bike away for that long even if it comes back pristine, because it could have been making more money a single rental at a time. Finally, If you require a bike for a season, but not afterwards, then you might consider buying one new or used, keeping it maintained, then selling it before departure, to someone just like you. This town is full of students, don't forget. Do you rent, shoes, bags, repair kits, or anything that isn't on this site? This question stems from the idea that something as convenient as delivery must also have unlimited other amenities hidden from plain view on our site. Our site has ALL items available on the home page, except for helmets & locks, which are free accessories. No secrets here. Since we are NOT a bike shop, many think anything bike related can be obtained for inclusion into their rental. Not so. Tube/tire repairs have happened less than 6 times in the more than six years of operation, thanks to the upkeep we provide. Our bikes are not more than 2 years old. Finally, we have a waiver that includes limiting the renter from doing their own mechanic work on the bikes for liability sake. We cannot assume all renters are capable of doing repairs safely. We prefer that a renter take our bikes to a shop & we reimburse them upon return with a receipt of work done. Can stems be swapped, aero bars added or handlebars raised? No. See last paragraph of previous question. Can I have a bike delivered right now? I thank the internet for its creation of my business minus a storefront with all of the overhead & capital required. But it also makes people think that everything is just a phone call away, when you want it. We serve the Washington, DC area. Washington, DC is #1 in TRAFFIC in the USA. Secondly, if anyone is interested in a riding immediately, then they probably aren't the first ones with the idea to contact us for use on that day. Some get mixed up by the bike share system in DC, assume we are those guys and deliver those red bikes on call. Not so. The early bike reservations get bikes first. No different than car rentals. We'd love to get a bike to you but we are limited by space, time & physics. If by "now" you mean within 90 minutes or so, we may be able to fulfill your needs. Even if the day is slow for us, traffic still has to be accounted for, as well as distance from where our bikes are to you. You cannot come to us, since we might already be out picking up or delivering a reservation made in ADVANCE. The best thing the city can do for its growing transportation issue is copy, copy and copy some more. Take ideas from where success has been achieved. Europe and almost anywhere else in the world has better treatment of bike riders. They have an institutional respect for the bicycle. DC traffic has topped the nation's charts for 2 years. Thanks to the security from past economic downturns, construction and an increase in residents continues unabated in the Capital. So, how would a county deal with adding more citizens into the transportation soup? Adding more roads? Has that ever worked anywhere? Sustainable DC may be formulating an answer. But it needs input from the community. The transportation sector is what we at Bikes to Borrow are most interested in, but all of the pieces matter. We want more biking in the District. Our wishes have been coming true on that. But the infrastructure and respect has been slow to develop. Parking structures need to be implemented to give safety to citizens and more space on the sidewalks for walking and wheelchairs. The assumption that you can find a free sign or post in a popular area is not true anymore. To us this spells OPPORTUNITY! Underground automated parking for bikes is in Japan & Europe. When will we get it here? Hmm. 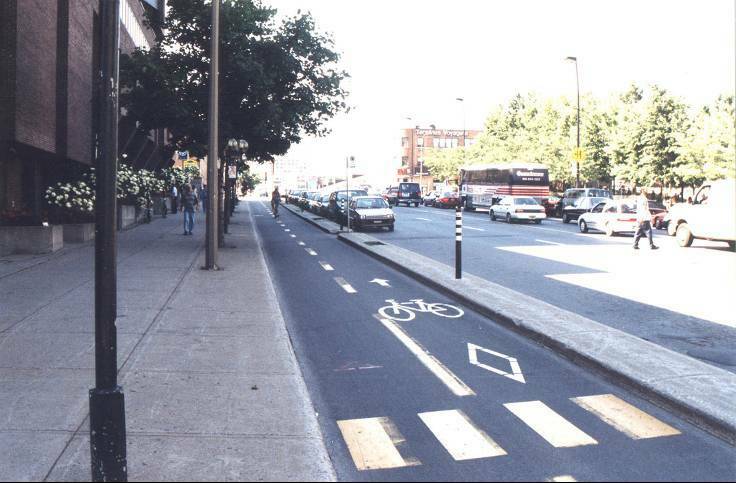 As for street space, studies show segregating the bikes from the autos will reduce 50% more injuries and improve traffic. 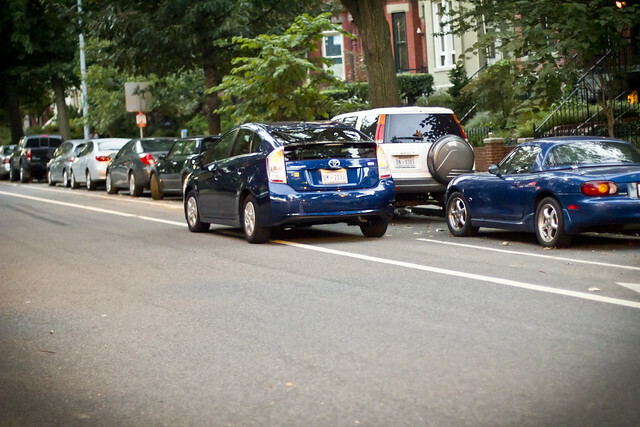 If there are barriers between them, like parked cars on 15th Street NW, injury saving goes up to 90%. But we all know that it is easier to drop some white paint on a road and assume no one uses the bike lane as a skinny lane for cars. In education, there are steps to get at each generation. Children should definitely be given a curriculum of skills, laws, and etiquette. Driving tests should have at least ten percent of the exam dealing with bike interaction. In parts of Europe, they are taught as children to open the car door with the hand farthest from the door, forcing you to look over your shoulder before opening. Adults need officials explaining to them that the change is for the better. "More cars are not the future" stated mayor Gray. And only so many can fit on the Metro. Bikes to the rescue! 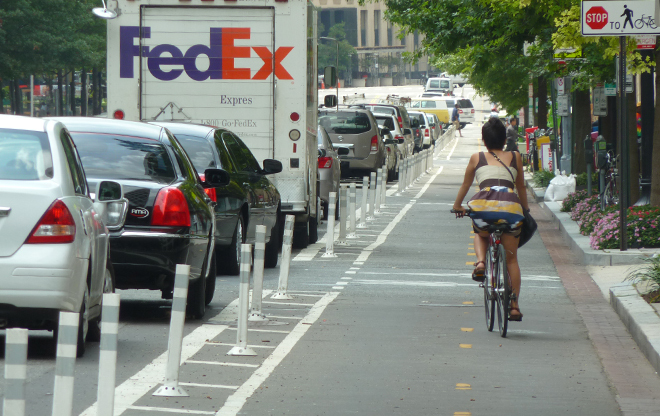 The first thing many are concerned about are the laws of riding around the Nation's capital. There are portable resources listed below for your use. *UPDATE: The mobile apps give you great insight into what cops might forget, egal council, emergency contacts, etc. Side Note: Did you know there's bike insurance now? Aimed primarily at commuter or daily riders it seems. But it makes sense.